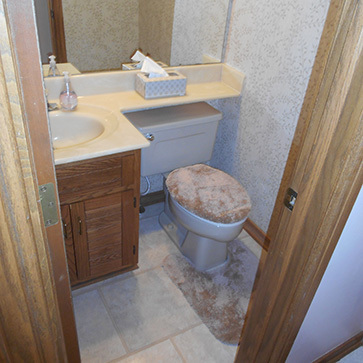 We’re sharing one of our favorite bathroom remodels in Worthington, Ohio. 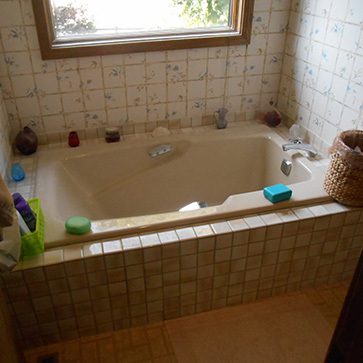 As a home remodeling company, NJW, renovates bathrooms of all sizes, including half baths, hall baths and master baths. In this project, the clients were content with the existing layout of their home’s three bathrooms. The problem was the outdated 1980’s style was weighing heavily on their enthusiasm and love for their home. 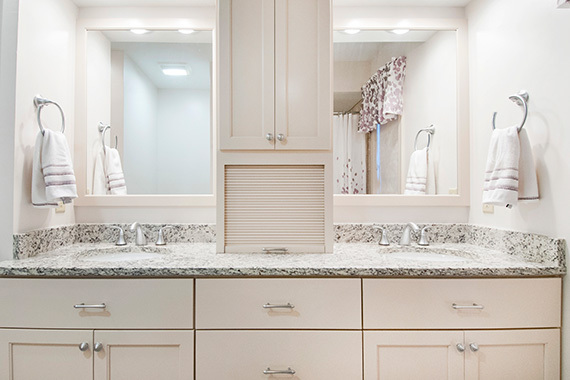 First, we had to move the soffit lighting in the hall and master baths to accommodate stacked upper vanity toppers. 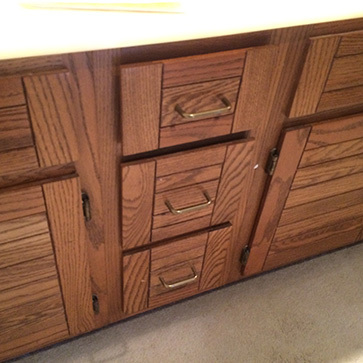 We then designed, painted and installed custom cabinets, creating additional storage space. To ensure a seamless look with the new design, we also replaced the front of the hall bath linen cabinetry to match the new cabinetry. 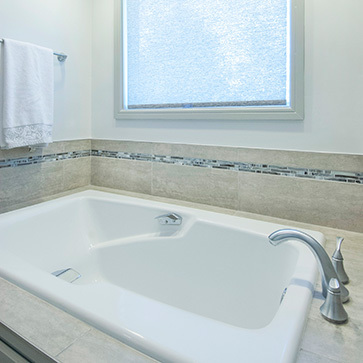 Gorgeous granite stone countertops were installed to all three baths. In addition to being durable and low maintenance, granite is also perfect for areas that frequently get wet like around bathroom sinks. 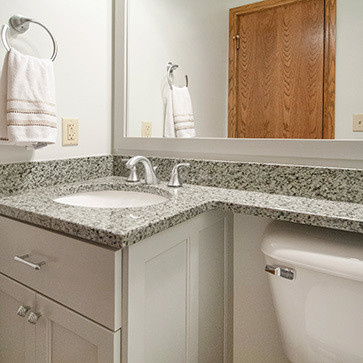 Not just for kitchens anymore, granite adds elegance and style to bathrooms too. 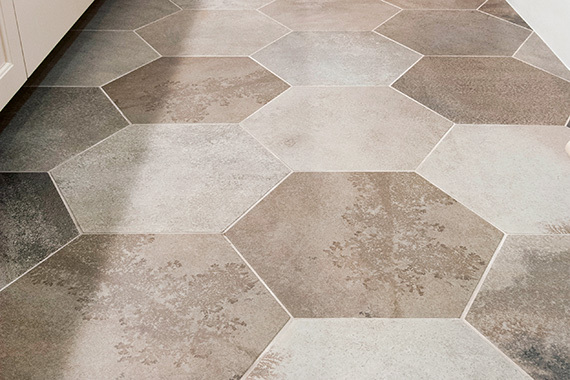 Ceramic tile and glass accents add character and charm to the hall and master baths. Large stone tiles create the backdrop for the shower interior and tub surround, while smaller accent tiles add shine and depth to the design. By replacing the fixed shower heads with handheld slide bar shower fixtures, the homeowners now have more versatility when bathing. 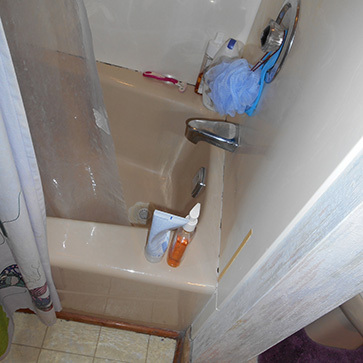 They can easily adjust the height of the shower head to stand under the water spray, or hold the shower head in their hand, utilizing the extended metal hose for convenience. The master shower features granite shelves, a floating bench with a granite top seat, and a granite threshold to complement the countertops and unify the space. The shelves are perfect for easy access to shampoo, soap and other toiletries, while the bench is a safe spot for shaving legs or pedicures. 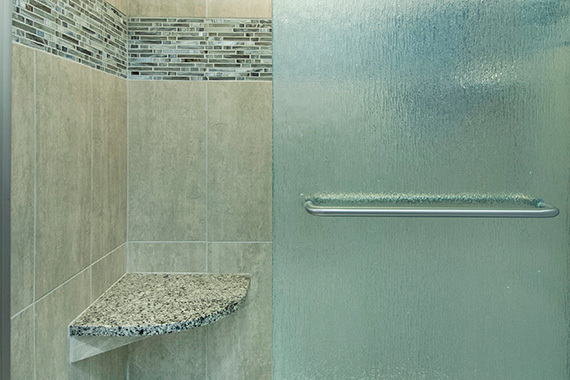 A rain glass shower door helps minimize the appearance of hard water residue while also adding privacy. The floating bench is supported by an alloyed aluminum frame (Better Bench) fastened directing into studs and blocking within the wall. It has a safety load capacity of up to 400 lbs, is corrosion resistant, and is finished with tile and grout to match the shower materials. 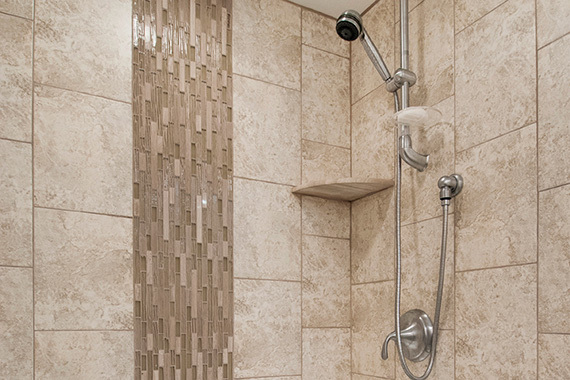 The floating feature allows for open shower pan space with no intrusions. The homeowners now have three amazing, updated bathrooms in their home for their own personal use, as well as for guests to enjoy. 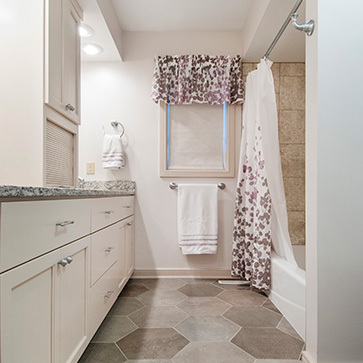 If you’re ready for a bathroom remodel, NJW home builders renovate homes in Worthington, Ohio, and the surrounding areas. 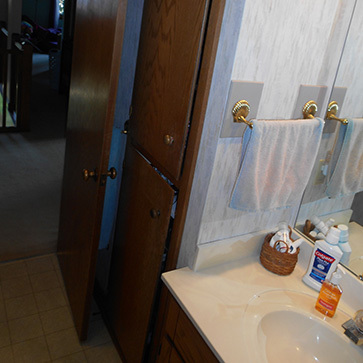 If you are looking to remodel the bathroom(s) in your home in Worthington, Ohio or the surrounding area, contact NJW today! For some remodel inspiration, check out our gallery.